This time of year is the start of the British Asparagus season and some early crop has already reached the shops. But, right now it’s very expensive to buy…and difficult to find. Now, I was brought up feasting on British Asparagus. We had a large walled vegetable garden at home and when we first moved there I can remember my mother being completely bemused at the rows of beautiful green ferns. I seem to recall she spent the first summer cutting the fronds to go in flower vases. Then, one of my Dad’s patients offered to help in the garden (as he had done for the previous Doctor) and my mother had her knuckles severely rapped. The asparagus season is quite short lived and traditional gardeners will tell you that cutting after the season ends will spoil the crop for the next year. It starts on 23 April and finishes on Midsummer’s day. Asparagus beds are also things you set up and leave…for years and years. One of the few exceptions to the concept of crop rotation. So, what I had in my fridge was NOT English asparagus, although it was the green sort rather than the white European stuff. I buy imported asparagus when it drops in price, usually a sort of warning that real English Asparagus will soon be around. It’s not quite the same and I think it needs some kind of dressing or accompaniment. In the recipe leaflet that we were given on the Nathan Outlaw cookery day was one that had already caught my eye for ‘Classic baked Asparagus Cheese’. It’s a gratin of asparagus made with Davidstow cheddar. It took my fancy because I am not a great fan of eggs, so I tend to avoid those recipes which involve soft boiled or poached eggs, or chopped eggs…and that cuts out quite a few options for serving asparagus as a light lunch. Place the asparagus spears in a microwaveable container, cover with boiling water from the kettle and zap in the microwave for 30 seconds. 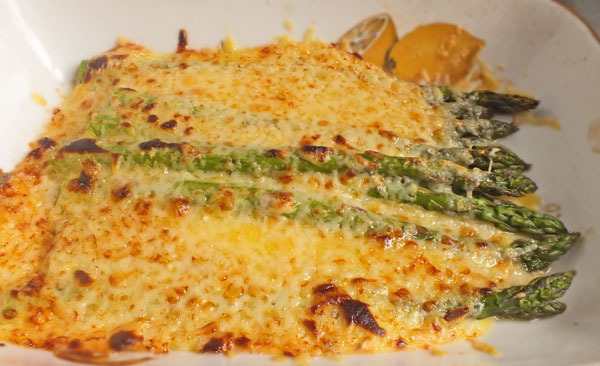 Place the asparagus spears in a buttered baking dish, cover with sauce and then top with grated cheese. I didn’t make many changes to the Nathan Outlaw recipe posted by Davidstow Cheddar on their blog. I did cheat a bit when I was blanching the asparagus by boiling up some water then zapping the asparagus in the microwave. The mustard used was Maille honey mustard and although the cheese was Davidstow, I only had the rather stronger Cornish Crackler. So, I used a little less than the recommended amount of cheese in the recipe and I think the more intense flavour was probably balanced rather nicely by the sweet Maille honey mustard. My only recipe ‘comment’ is that to get the nice golden top to the gratin, I needed to put the dish under the grill for a minute or so. Another time, I will cover the tips of the asparagus with sauce – this time I was taking a photo, so I wanted it to look pretty…but common sense should have prevailed – the tips are the most delicate part of the plant and would have benefitted from being protected a bit. I can report that the pairing of Davidstow Cheddar and Asparagus is a very good one. I think this dish would work well with ham hock added in for something more substantial, but as it stands it was a lovely light lunch. I’d serve this as an accompaniment with a simple grilled fish dish or perhaps with gammon. This would have been easier with a slica to grate the cheese! Oh can’t wait for some local asparagus and this looks like a good recipe to use if you were lucky enough to have a glut of it. Was hoping ours might have come to something this year, but we only planted it the year before last, so I guess I was being a bit hopeful. How lucky to inherit a mature asparagus bed, made me laugh though with your mother cutting it for flowers. How was your Nathan Outlaw course – hope he was good. Keep meaning to see if you’ve written a blog post about it. My mum was something of a character…her flower arrangements did look lovely with all the asparagus fern behind it and I guess if you’d never seen it growning you wouldn’t associate those funny spears with the pretty fronds you get later on in the year.